The dominant wave direction in the New York Bight is from the southeast - ultimately from prevailing wind zones and storm events in the tropics and the South Atlantic region. Hurricanes during the summer and nor'easters during the winter are responsible for intense periods of sediment transport and beach erosion or accumulation. One major storm can move more sediment than the cumulative amount for the rest of the year. In the New York Bight prevailing wave energy forces sand movement westward along the south shore of Long Island and northward along the New Jersey shore. Sand ultimately accumulates on the spits and submarine bars in the Outer Harbor area. Tidal currents of the Hudson River estuary tend to keep the beach sand flushed free from the Verrazano Narrows portion of the Inner Harbor area. The modern transgression of the sea has resulted in a landward and upward migration of beaches and barriers through space and time [LUST]. In a vertical hole dug through coastal plain deposits a transgression of the sea is recorded as follows: sediments deposited in "landward" environments are overlain by sediments deposited in "seaward" environments. The opposite is true for sediments that accumulated during periods when sea level was stationary or falling. The continuous supply of sediments from rivers on land, from longshore currents, and from marine currents on the continental shelf cause the shoreline to prograde down-current and seaward. 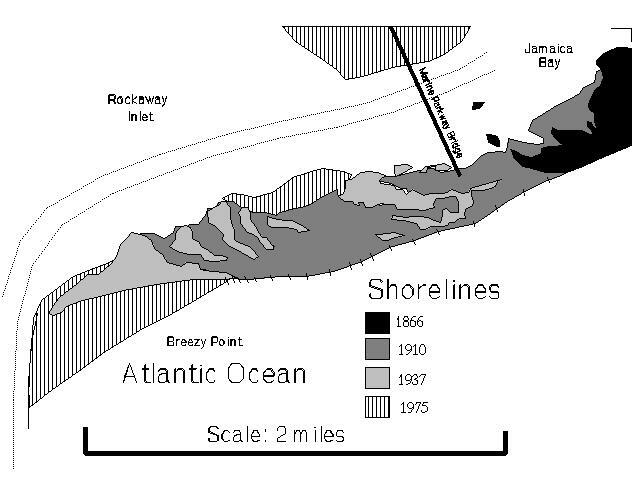 The evolution of the spits on Sandy Hook and Rockaway are a testament of this migration processes during historic times. The sorting action of waves and nearshore currents cause sand and gravel to accumulate nearshore on bars and on beaches, whereas currents transport the finer-grained silt and clay to quieter water settings (deeper water, restricted bays, lagoons, or tidal flats). This refining process is basic to the understanding of beach processes. Either an increase in wave energy or a cut-off of sand supply will increase beach erosion. Stable beaches receive a constant supply of sand to replace that which was removed by erosive forces or sand consumed by the grinding action of waves. The later process is exceedingly slow but has significance in the study of the aging of sand. Fresh sand from mountain streams tends to be quite angular in shape. The particles are composed of rock and mineral fragments that cannot withstand the constant long-term grinding action caused by wave energy in the surf zone. Through time, only the most resistant minerals survive. Sand that has endured many millennia of constant wave energy consists almost entirely of well rounded quartz grains along with traces of more-resistant "heavy minerals." The study of heavy minerals is an important tool for analyzing certain characteristics of sand. Heavy minerals include substances that have a specific gravity greater than 2.65. Specific gravity is the ratio of the weight of a given substance to the weight of an equal volume of water. Heavy minerals are concentrated in "black sand" deposits on beaches by refining processes involving both swash in the intertidal zone and by the sorting action of wind in the back beach area. Examples of heavy minerals include garnet, zircon, tourmaline, topaz, magnetite, hematite, apatite, kyanite, glauconite, etc. These minerals form in a variety of geologic settings and are indicative of the general characteristics of the conditions from the source area. For example, tourmaline, topaz, and zircon generally form in intrusive igneous rocks; garnet and kyanite are most abundant in metamorphic rocks; glauconite and hematite is most abundant in marine sedimentary rocks. Heavy minerals also vary in their resistance to long-term abrasion by wave energy. As sand is continuously reworked many of the heavy minerals decrease in abundance along with their lighter, less resistant mineral counterparts. 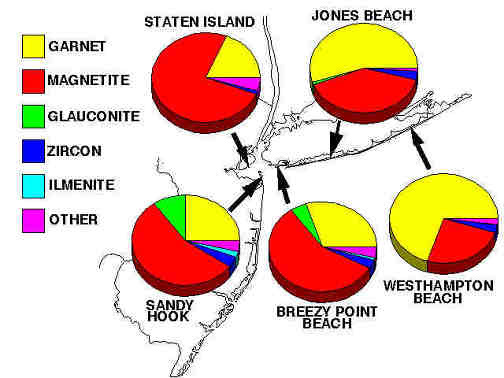 The figure above illustrates the varying composition of essential heavy mineral concentrates from five beaches in the New York Area. Heavy mineral sands were collected from the upper intertidal zone from each beach during the month of April, 1996. Heavy mineral sand samples from Westhampton Beach and Jones Beach are dominated by garnet and magnetite with relatively little or no glauconite. The source sand of these two beaches is probably reworked outwash from the glaciers. The glacial material contains abundant sediment from the igneous and metamorphic terrane of the Highlands region. Sand from Sandy Hook contains abundant glauconite, zircon and ilmenite, but less garnet than Long Island beach sand. This sand was derived, in part, from reworked Cretaceous and Tertiary sedimentary formations and older sediments and mafic igneous rocks of the Newark Basin. The heavy mineral sand from the south shore of Staten Island contains abundant magnetite and comparatively little garnet. The general character of this sand is also very different from the other sands. It is less rounded and poorly sorted, and it contains abundant feldspar and rock fragments suggesting that the materials were derived mostly from the rivers draining the Newark Basin region (the Passaic, Hackensack, and Raritan rivers). The most unusual sand sampled is on Breezy Point Beach. This sand is generally the most fine-grained of any area beaches. Its appearance and composition is most similar to sand from Sandy Hook, an observation contrary to general understanding of processes of longshore drift. 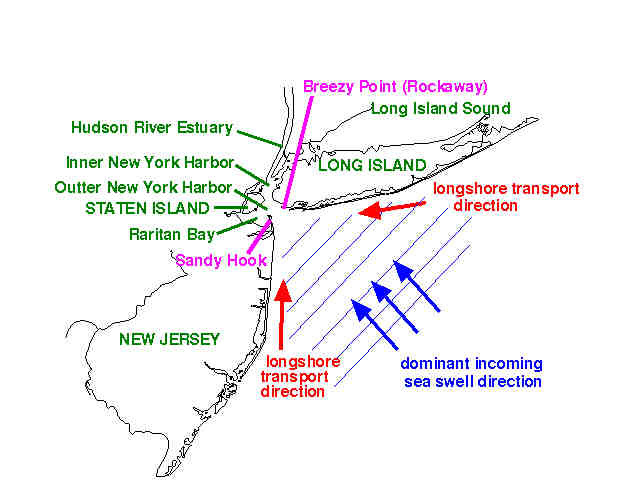 Longshore current transport is dominantly east-to-west along the southern shore of Long Island. This means, in theory, that sand currently on Westhampton Beach should eventually migrate to Jones Beach, and then on to Breezy Point Beach before disappearing into the depths or accumulating in parts New York Harbor. Storm and tidal currents transport some sediments out onto the continental shelf. Much of it disappears into the Hudson Canyon leading eastward toward the deep ocean basin beyond the continental margin. However, the curious nature of Breezy Point Beach sand hints of complexity involving a variety of factors. Perhaps the best explanation for the character of the sand on Breezy Point is that it is a mix of materials that has accumulated in the area at the mouth of the harbor. The sand has probably survived many cycles of transgression and regression, and is therefore generally "older" than the other sands of the surrounding localities (with perhaps the exception of the material on Sandy Hook). Fossils from Breezy Point Beach are similar to fossil material collected on Sandy Hook. In general, the encasing matrix around fossils from both localities seems to have the same appearance, composition, and texture. Fossil-bearing material (called "beach-rock") is most abundant and larger in size on Sandy Hook than on Breezy Point Beach. No fossil material was found on either Westhampton Beach or on Jones Beach. This suggests that the "source" of these materials is most likely from the south, possibly submerged ridges several miles offshore from Seabright, New Jersey. Fossils found on New York beaches are not abundant, but are also not uncommon. (Our experience of spending several hundred hours searching beaches has yielded about enough beat-up fossils to fill a standard shoe box. The best ones are illustrated on the "fossils" web page.) Many "fossil-like" specimens of recent shell materials can be found on beaches. Beach rock is actively forming in some locations along the shore, especially in crevices on man-made groins, jetties, and sea walls where shell hash accumulations are frequently subjected to drying and lithification by precipitated cements (iron-oxides from rusting beams and ship wrecks, and salts from sea water including druzy calcite). Our preliminary interpretation of the fossils we have collected suggested that they are preserved in sediments deposited during massive storm events affecting the nearshore, barrier, and back bay environments. In the past storm erosion breached the barriers causing massive amounts of sand and mud to flood the back bay areas, smothering and preserving a variety of benthic organisms. Concretions formed around decaying organic matter, helping to preserve the delicate detail of fossils. One such massive event occurred approximate 7,600 years ago affecting both the shorelines in the Rockaway area and on Sandy Hook. A preliminary evaluation of the fossils preserved in a number of similar concretions derived from offshore deposits suggest that the storm occurred in late summer (a massive hurricane).